Finishing fabrics and materials. Crucial the upgrade has the correct selection of finishing materials. You need to remember that the legacy product can be updated only fashion cloth, fashion material. Fashionable fabrics for clothes - it's fabric with expressive texture of the surface or smooth. Trendy materials include faux leather and suede, knitted fabric and dovesi, faux fur. It is important to successfully combine fabrics and materials. Soft, textured fabrics - boucle, basket weave, tweed, etc. - fit together quite easily. Dyed fabric can be combined with istrodent in stripes or checks. Possible combination of both tonal and contrasting. Interesting combinations of fabrics with different texture. For example, the tissue type of curl can connect with an easy, smooth drape; smooth drape with fabric nubby weave or faraway. Such combinations can be resolved in one color. Different shades of fabrics not of fundamental importance. 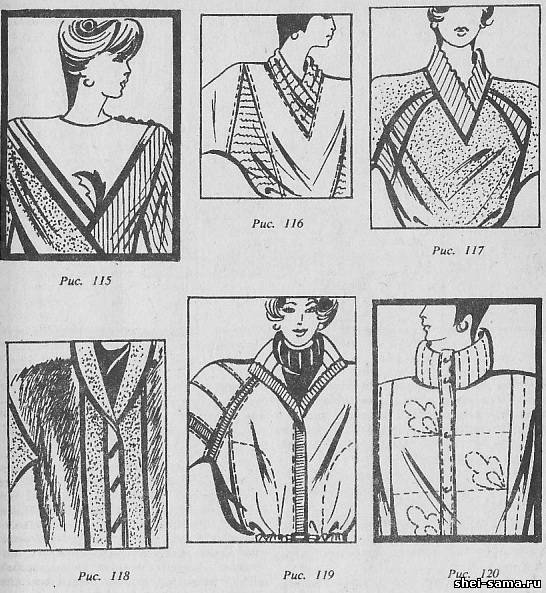 Separate areas for products made of these fabrics: Flirty, inserts of various configurations on the shelves, the back or on the sleeves, collar, pockets, cuffs, edgings (Fig. 115) - can be done from faux leather and suede. An interesting proposition of modern fashion is the design of a Jersey. Knitted fabric is best to enter the areas where products are subject to creasing, i.e. the openings on the shelves, sleeves (Fig. 116). The collar and cuffs of knitted fabrics or knitted dawasa will create a certain comfort in wear (Fig. 117). In the design of the updated products can be used faux fur in combination with the fabric, knitwear and leather in different variants (Fig. 118). A great opportunity to create new products give cloaks. Jackets, shirts, skirts, tunics, vests, shorts - here's the range of this group. 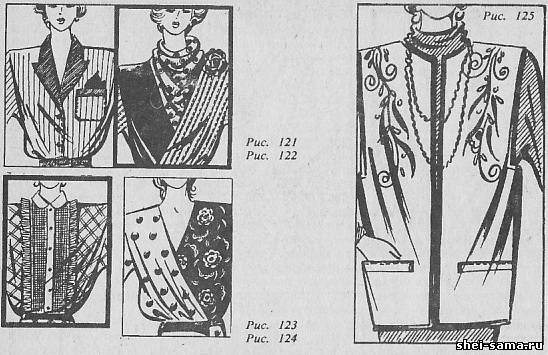 Possible combinations here are almost the same as that of the overcoat fabrics. It is possible, moreover, to use corduroy (Fig. 119). Products, redrawn from mantle tissue is mainly youth clothing and clothing for children. Therefore, it must be expressive in design. Jacket and shirt from mantle fabrics are offered in various lengths and proportions, they can be protegat on the batting, or synthetic fleece (Fig. 120), made with faux-fur lining, using for this purpose an old coat. Worsted suiting fabric depending on the texture and pattern can be used in different ways. The difficulty in the selection of finishes are classic fabric men's suits with their strict structure, mostly with stripes. But they can be decorated artificial and natural leather and suede fabrics with surfaces for leather and suede, details of knit. Assortment of products from men's suiting fabrics with stripes is primarily women's classic suits and dresses, coat-dresses and dress suits in the classic design (Fig. 121).Fabric without a pattern can be combined in the same way as fabrics and use them in jewelry sports. Woolen dress fabrics can be combined with a knitted fabric and artificial leather, but more thin and light than in the group of clothing. Interesting multi-color combinations of different wool fabrics in a single product (Fig. 115). Woolen crepes are ill-matched with other types of fabrics therefore it is better to combine them among themselves. For finishing you can use knit open weave (Fig.. 116). Silk fabrics are combined with more strictly. They are combined only in color and pattern, but the density, thickness and nature of the weave must be identical or very close. In this group, the most acceptable traditional combination of smooth and patterned fabrics. Fabric with geometric pattern - with stripe, pea stripe or plaid, stripes and peas combine well with each other, usually in one color (Fig. 122). An interesting combination of different patterns, such as small and large chickpeas, small and large cells (Fig. 123). Considered to be the latest trend fabrics with patterns patchwork character that combines a geometric composition with a vegetative ornament. This effect can be achieved when combining the different silk fabrics in a single product. Well, if these tissues will be the same color or approximate. An example is the combination of silk fabrics in black and white design: stripe, pea, white flowers on a black background (Fig. 124). Obsolete product, for special occasions, made of very beautiful fabrics - lace, velvet, can also be upgraded. These two fabrics are well along with each other. Velvet dress is a good complement lace collar. Lace dress details velvet: yoke, inset waistband, etc. if the form of the obsolete product does not correspond to the fashion, dress of lace fabric can be changed into a blouse, and a velvet dress will be dressy jacket which you can decorate with embroidery thread lurex shiny band (Fig. 125). Great value for the decoration of clothing has updated hardware. Modern fashion offers metal accessories: button, zipper, hanatani, different size and shapes buckle. Clothing classic character is made buttons from plastic, wood.